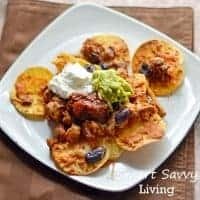 This loaded chicken nachos recipe was made with salsa and compensation for other ingredients provided by Martinez Salsa. One of my favorite cuisines to eat when we go out is Mexican, but lately we’ve been trying to eat out less and less for both our health and budget. Nachos are one of my favorite appetizers to get even when we’re not at a Mexican restaurant, so it was only a matter a time before I tried my hand at making some at home. So, I was super excited to try Martinez Salsa to help make my nachos taste even better. 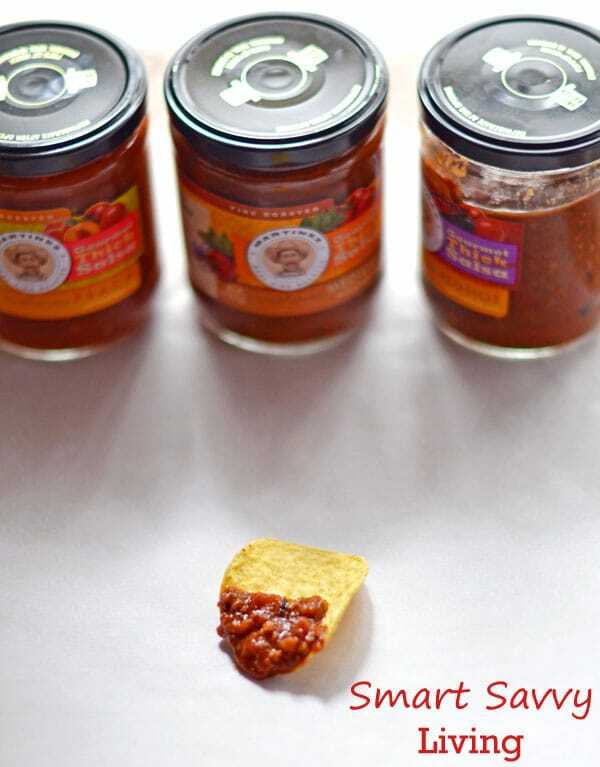 Even though it’s simple, plain salsa on a chip is one of my favorite ways to enjoy salsa. Sure, salsa is great just on a tortilla chip or taco, but I really love using it to help add a punch of flavor to the meat in dishes like quesadillas, tacos, nachos, etc. as well. I hate to get my hopes up for awesome looking tacos and quesadillas only to take a bite and find that the meat is dry and tasteless, which seasoning with salsa prevents. I loved that Martinez Salsa really isn’t like all the other salsas out there. Theirs is actually fire roasted and contains spices like chili powder and cumin which bring out SO much more flavor than traditional store-bought salsa. It also has a thicker consistency that I enjoy, but also won’t water down dishes when you cook with it. For dinner recently I made a huge pan of loaded chicken nachos with Martinez Salsa. All of the flavors have been great to try, but we loved the Red Hot variety the most. We didn’t really find it to be overly spicy, but we love spicy foods anyway and found it had a nice bit of zing. The peach was also great to give a different, yet tasty, flavor profile to chicken. I loved using it to change up one of my common lunches, a chicken quesadilla. I have to honestly say, Martinez salsa is the best store-bought salsa I’ve ever had! I used the Red Hot to make our loaded chicken nachos. I had saved some of the cooked chicken to put on a salad the next day for lunch, but I loved the nachos so much I had to make more! 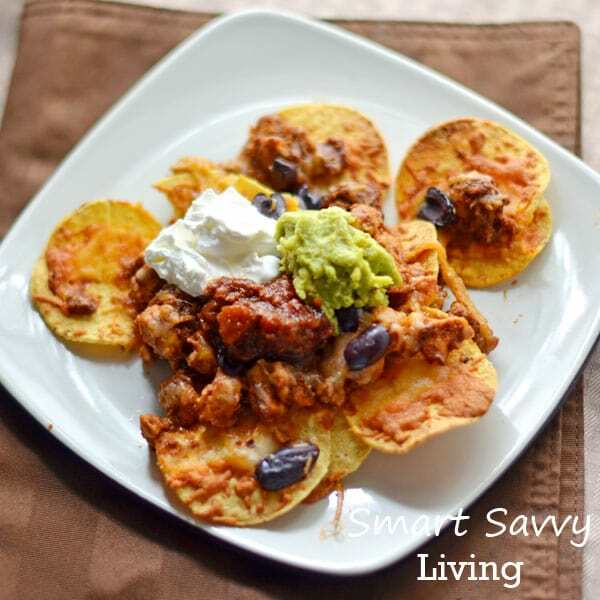 These loaded chicken nachos are so hearty, they can be served as an appetizer or entree! Head medium-sized skillet over medium-high heat for a few minutes. Place about 1 Tablespoon of olive or vegetable oil in skillet and swirl so that it coats the bottom of the skillet. Add in chicken and sprinkle with desired spices such as chili powder, cumin, garlic, salt and pepper. Once chicken is almost cooked through, add generous tablespoons of salsa to the chicken. You want enough so that it is thoroughly seasoned and moist, but not so much that it gets watery. Once chicken is cooked through, remove from heat and set aside. Line oven-safe dish such as a 9 x 13, half sheet pan or large plate with foil, if desired, to make clean-up easy. Spread an even layer of tortilla chips over oven-safe dish. Sprinkle your desired amount of cheese on top of chips, keeping in mind you'll be adding more. Spoon chicken and any other toppings you would like to be warmed on top of chips/cheese such as olives. Sprinkle a bit more cheese on top. Continue with another layer as above, if desired. Place in oven for about 5 - 10 minutes until cheese is melted and browned as desired. Exact time will depend on how much your making and the layers. Take out of oven and top with extra desired toppings. We're big fans of red onion, green onion, sour cream, guacamole and extra salsa. Serve immediately. Leftovers can be refrigerated and reheated, but this dish is definitely best served right from the oven. If you're not feeling like chicken, this recipe can also be made with other meats such as beef, pork and turkey. You could also leave out the meat all together or used refried beans in its place. Win It: Thanks to the generosity of Martinez Salsa, one lucky Smart Savvy Living reader will be winning their very own set of Martinez Salsa! Prize includes each flavor of salsa and a tortilla griddle. Winner must be 18+ and a legal resident of the 50 United States + DC. Prizes cannot be shipped to PO Boxes. Martinez Salsa is sponsoring the giveaway and Smart Savvy Living cannot be held responsible for prizes in any way. Please complete all entries in the Rafflecopter below. The only mandatory entry is to leave a comment, but the more entries you complete the higher your odds of winning. Please allow a minute for the Rafflecopter to load. Disclosure: I received products at no cost along with monetary compensation to buy ingredients for the recipe for this post. 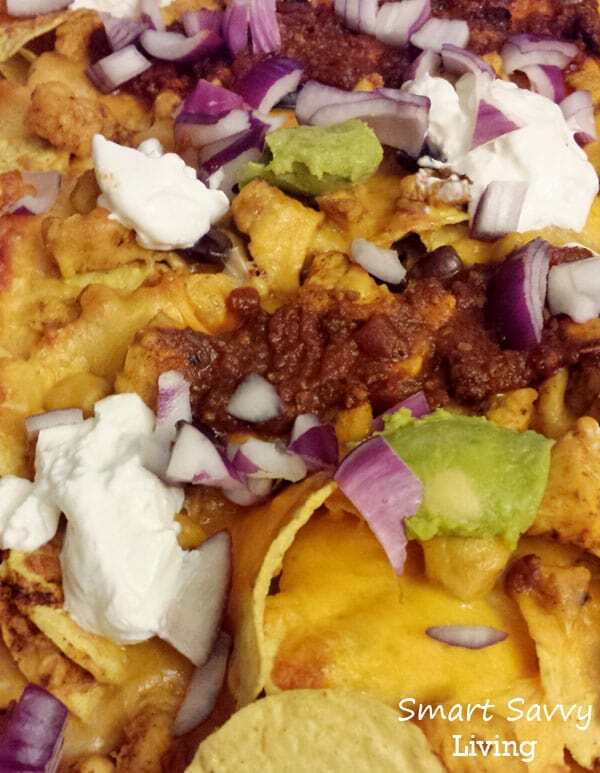 Check out our Spanish Rice recipe if you enjoyed these Loaded Chicken Nachos! These look so yummy…we must try this! Great photos..what camera are you using? Look delicious!! I will definitely have to try this! I love the rich taste of Mexican foods. This chicken nachos looks really appetizing. Thanks, Jeremy. They are really tasty! Wow the recipe looks amazing! I would love to try the peach salsa because I have never tried a fruity salsa before and it sounds really tasty! No question, I want to try the Peach Salsa! I would like to try the peach one….. I would really like to try the peach!!!! I would love to try the Peach salsa! !